After a morning of cleaning the other day, I surveyed my fridge and decided that Indian fare was what I wanted for lunch. With the already chopped cauliflower I had on hand, I quickly cut the other veggies and heated up my cast iron skillet for this warm and savory dish. You can also serve this chilled over a bed of spinach or baby greens which soak up the juices and spices. Warm or cold – I love the flavors in this! Heat coconut oil over medium high heat in a skillet. 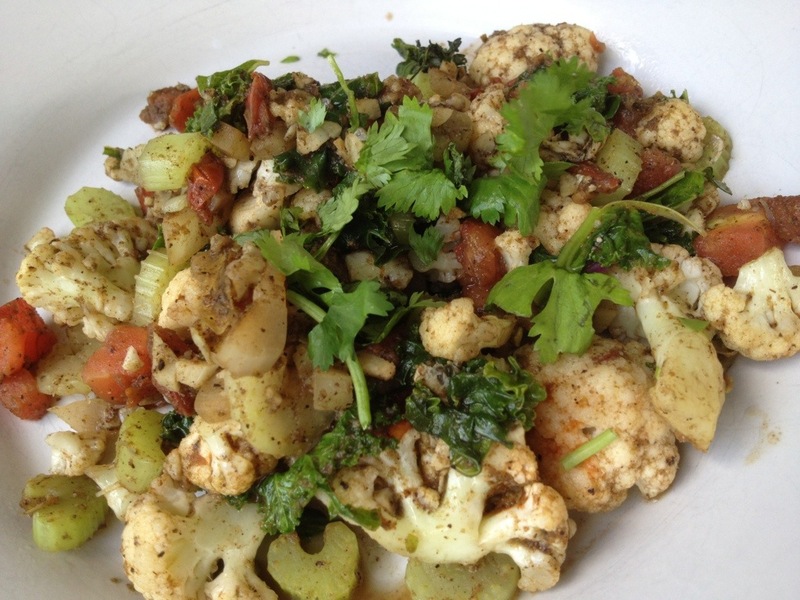 Add cauliflower, tomatoes, celery, onion, and garlic. Sauté for 5 minutes. Add in water, Indian spice mix, and hot sauce. Simmer for another 5 minutes. Serve warm and garnished with cilantro. Makes 2-4 servings. Mix together and save remainder for future use.